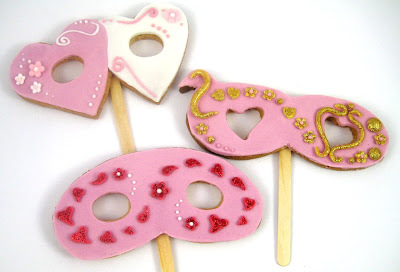 Pretty pink mask sugar cookies I cooked up for a bunch of pretty little girls. Think I might call them Harlequin Heart (white and pink), Diva (pink and gold) and Swirling Heart mask (pink and red). I'll be doing up a tutorial for one of these and would love to know which one you would prefer the tutorial for? They are beautiful!! I love the one with the gold hearts. I look forward to the tutorial, whichever you choose to do. They're all great, but I vote for the Double Heart. so cool! Definitely the Harlequin Heart one! They are so cool! These are so pretty and cute! I love them! I'd vote for the one with gold on it. Gorgeous details! You have got to be kidding?! I love this site. I wish I were so talented. Love all the masks, super idea! Let my vote go to the pink mask with the gold design. Either way, they are are beautiful and worth trying to make. The pink and gold get my vote.